Incredible Solar energy – Radiant light and heat from the Sun Can you imagine living in a home where everything around you that requires energy has been fueled by the sun? It's true. What is Solar Energy and what are SPV cells? The Solar energy is the energy from the sun which is considered as an environment friendly, non–conventional source of energy. 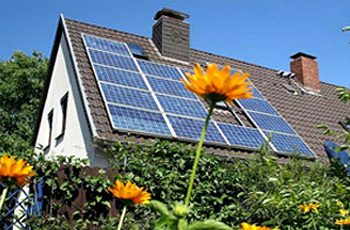 Solar energy is non – polluting and, therefore, helps in lessening the greenhouse effect. 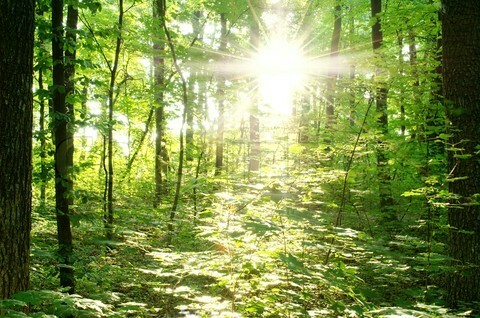 The energy that reaches the Earth in the form of sunlight is immense – more than 12,000 times greater than the world&apos;s fuel consumption. The Sun sheds its rays thinly over a vast area and its heat must be collected and concentrated before it can be used in houses or power plants. Space crafts and satellites also depend on solar cells for their energy requirements. CSP technology Concentrating solar power plants produce electric power by converting the sun's energy into high-temperature heat using various mirror configurations. The CSP systems concentrate a large area of sunlight in to a small area using lenses. Due to this huge amount of power in a small area large amount of heat could develop and can be used to rotate the steam turbines of a heat engine. Hence we can get electricity from the rotating turbines. Concentrated Photovoltaics (CPV) are the ones in which the concentrated sunlight is directly converted into electricity using the phenomenon of photo electric effect. Thus CPV is different from CSP. In domestic hot water systems which use the solar energy of the Sun, the solar panels are mounted on the roof of the house. They are made of glass panels behind which water is pumped through pipes that are painted in reflective black color to absorb maximum sun light. Thus the absorbed heat is used to make hot water, and later it gets pumped to a hot water tank. The Nuclear and thermal Power plants would use the nuclear energy and coal as the heat sources for the generation of steam that can rotate the turbines which in turn generates electricity. The CSP technologies are popularly known as the solar thermal technologies or can be termed as thermo – electric technologies. Solar panel installed on the roof of a house Solar photovoltaics (SPV) are in the process of converting solar radiation (sunlight) into electricity using a device called solar cell. Solar Cells (Photo voltaic cells) can convert sunlight directly in to Electricity. 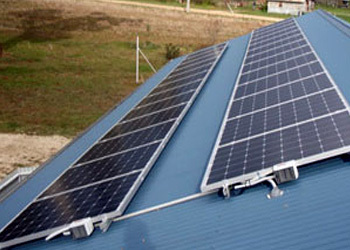 The Solar Photovoltaic panels (SPV) constitute a reliable, industrially matured, green technology for the exploitation of solar energy. The SPV panels operate autonomous without any noise generation as they do not incorporate any moving mechanical parts unlike wind turbines. SPV panels require minimum operating costs and their maintenance is a bit cheaper compared to other renewable technologies. All these solar cells produce direct current instead of Alternating current. The direct current produced by the PV cells must be converted to the AC using inverters. The high popularity for home based applications of the solar panels are made by the ease of installation and reduction in the costs of PV cells made them affordable to all which are driven by industrial maturity of PV technologies. A bunch of solar cells Solar panels collect solar radiation from the sun and actively convert that energy to electricity. 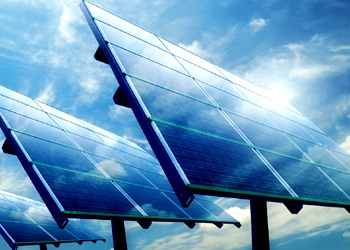 Solar panels are comprised of several individual solar cells. These solar cells function similarly to large semiconductors. The efficiency of a Solar cell can be defined as the ratio of the electrical output of a solar cell to the energy of the incident sun light. The efficiency of the energy conversion of a solar cell (η) can be measured by taking the ratio of the output power Pm of the solar cell at its maximum to the product of input solar light falling on the cell (denoted by E in W/m2) and its surface area (A, measured in m2). STC (Standard Test Conditions) refers to a temperature of 25°C and with an irradiance of 1000W/m2 on a clear day as the sunlight incident on the tilted surface of 41.81° above the horizon. There could be lot of factors that influence the electrical power output, like resistive load taken out from the cell, temperature, the spectral and spatial distribution of power. Watt–Peak is the maximum power that can be achieved by varying the resistive load of the cell. Thermodynamic Efficiency Thermodynamic efficiency limit is the absolute maximum theoretically possible conversion efficiency of sunlight to electricity. Theoretically the maximum conversion efficiency that can be possible using solar cells is 86% which is limited by Carnot limit. The solar cells operate as Quantum energy conversion devices, which are subject to Thermodynamic efficiency limit. 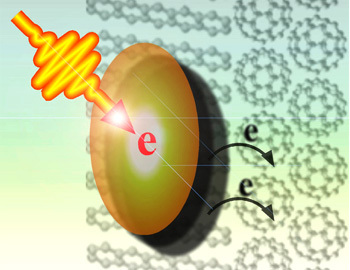 If the photons hitting the solar cell have less energy which could be below the band gap of the semi conductor, then that photon cannot generate the electron&dash;hole pair. Hence that energy of photon could be wasted as the heat energy. If the photons have the energy above the band gap energy then a fraction of the energy above the band gap energy can be converted into useful output. If the photon has greater energy than the band gap energy, then the excess energy above the band gap energy would be converted as heat. If the solar cells are made of multiple band gap regions of the semi conductor (absorber) materials, then the efficiency of the solar cell could be improved by dividing the solar spectrum in to smaller regions, where the thermodynamic limit would be higher for each region. Quantum Efficiency A solar cell's quantum efficiency value indicates the amount of current that the cell will produce when irradiated by photons of a particular wavelength. When a photon hits the solar cell and gets absorbed by producing an electron hole pair which would eventually reach the p–n junction to produce electric current. The Quantum efficiency would refer to the percentage of photons which are responsible for the production of electric current. There are two types of Quantum efficiency. (1) Internal quantum efficiency and (2) External quantum efficiency. The internal quantum efficiency refers to the efficiency with which the photons which are not transmitted (or) reflected of the cell that can generate considerable carriers. The external quantum efficiency refers to the effect of optical losses such as reflection, transmission, etc. The quantum efficiency is expressed as a spectral measurement as a function of photon wavelength (or) energy. Maximum Power Point of a Solar Cell Maximum power point tracking is a technique that grid connected inverters, solar battery chargers and similar devices use to get the maximum possible power from one or more photovoltaic devices, typically solar panels, though optical power transmission systems can benefit from similar technology. Every solar cell has a wide range of operating voltages and currents. The maximum power point of a solar cell can be found by increasing the resistive load from zero to a very high value. This is the point where the product of voltage and current would be a maximum value. The maximum power point of a photo voltaic cell is not a constant, it always depends on the incident light. However a high quality silicon mono crystalline solar cell at room temperature would produce 0.60 volts in an open circuit. To avoid the variation in maximum power point, a tracker, which tracks the instantaneous power continuously measuring both voltage and current. This information would be used to adjust the resistive load so that the power transfer is maximum, regardless of the variations in the incident light. Fill Factor of a Solar Cell This is a key parameter in evaluating the performance of solar cells. The fill factor can also be used to determine the series resistance of a solar cell. 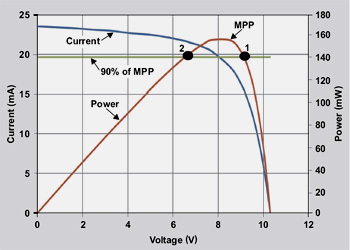 The ratio of the power available at the maximum power point to the product of open circuit voltage (VOC) and short circuit voltage (ISC), is known as the Fill Factor. One can achieve higher fill factor by increasing the value of shunt resistance or by decreasing the shunt resistance. Thus one can almost reach the theoretical efficiency using such techniques. Triple junction solar cell Triple junction solar cells have high conversion efficiency due to several photo absorbing layers typically made from indium and gallium. The efficiencies of a solar cell could vary from 6% (silicon based solar cells) to 40% (multiple junction). In commercially available solar cells (Si based) the efficiencies are around 14 to 19%. The highly efficient multi junction solar cells are not economical and more over they are still under research. A calculation of price per kilo watt hour that would be delivered is a method to express the economic costs of electricity generating systems. Any commercial solar cell has got a warranty of 25 years. The manufacturers keep in mind about the overall efficiency of the solar cell. The calculations of cost/kWh would vary depending on the useful life of the system. Recently the research team at Sharp Corporation announced that a solar cell capable of converting 44.4% of incoming sunlight into electricity was created. 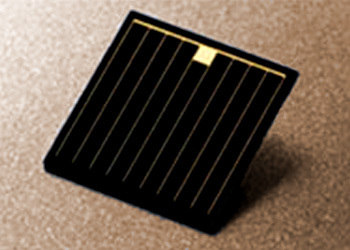 This solar cell is of the “concentrator triple–junction compound” type, which is a lens–based system to focus the sunlight on the PV cells. Thus the high conversion efficiency is due to several photo absorbing layers typically made from indium and gallium. Compound solar cells are mostly used in space satellites where high conversion rates and good space – efficiency are more important than costs. 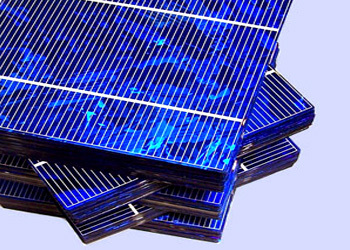 Thin film solar cells derived from amorphous silicon, pictured here, are gaining more and more attention in a market A thin-film solar cell (TFSC), also called a thin-film photovoltaic cell (TFPV), is a solar cell that is made by depositing one or more thin layers (thin film) of photovoltaic material on a substrate to increase the efficiency of absorption of energy. A solar cell that is thin and flexible, which is also known as the Thin Film Photo Voltaic cell (TFPV) has a thickness that would range from nanometers to micrometers. 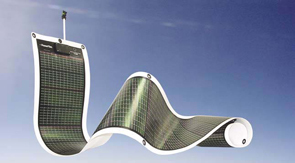 A thin film and flexible solar panel can be manufactured by depositing one or more layers of Photovoltaic semi conductor material on a flexible substrate. Scientists consider the thinner profile as a paramount to develop next generation solar panels. 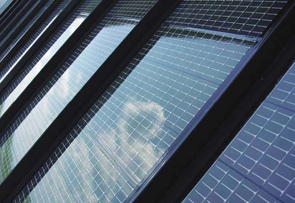 Most of the Commercial solar cells have rigid silicon wafers which are of thickness 150 μm. The future solar cells (TFPV) have thickness of about 1–4μm. TFPV&apos;s are much cheaper when compared to the traditional solar panels. TFPV&apos;s can be employed on any surface as they are flexible and light weight. All the components such as mounting hardware, wiring and other electronic hardware are comparatively cheaper than other PV devices. There are other type of TFPV&apos;s which are under research and could result in a better efficiency, these are CIGS (copper, Indium, Gallium selenide) thin films. A super flexible and light weight solar panel PowerFilm Solar manufactures thin, flexible solar panels by way of a proprietary, low-cost, “roll-to-roll” process. 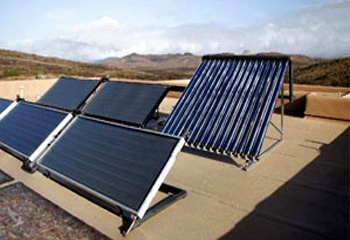 The rollable solar panels are monolithically integrated, which eliminates the need for damage-prone manual connections of individual solar cells. The TFPV&apos;s are manufactured using concentrated semi conductors that absorb light to convert in to electric current. They don&apos;t cause any noise or air pollution as the conversion is done silently at atomic level. A transparent contact on the TFPV lets the incident photons to enter TFPV cell and it is absorbed by the semi conductor. The valence electron in the conduction band of the semi conductor carries the energy from the photon to create electron hole pair. Hence a junction would result to provide electric field that separates and gathers the generated charge carriers. These charge carriers pass through the external circuit generating electric current. A lot of such single TFPV&apos;s form multiple cells in a protective pack for a large output.